When I walk into a restaurant offering Sichuan cuisine, I expect my tastebuds to get more than just a tickle. And I'm pleased to say that many dishes at the one-month-old Chengdu Restaurant in Amoy Street pack quite a fiery punch. Two chefs from Sichuan helm the kitchen of the 120-seat restaurant. Highlights on the menu include thinly sliced pork belly in garlic ($12.80) with a lightly spicy dipping sauce, and beef with pickles in sour soup ($25.80), which has a strong sour flavour and is not too oily. If you prefer something more spicy and numbing, go for the fish with green pepper soup (right, $26.80 or $35.80). It is made with green pepper, millet, garlic and fermented black beans which are first stir-fried, then simmered on low heat with superior stock, squid and fish head. Of course, not everything on the extensive menu is too spicy. The Chengdu 12 Flavours Chicken ($36.80, order one day in advance), also known as "beggar chicken", is a whole chicken stuffed with mushrooms and marinated in Sichuan spices. It is wrapped in lotus leaf and foil, covered with clay and placed in a special earthenware jar to bake over charcoal fire and served with 12 sauces. You can also put together your own sauce. For dessert, get the Giant Sesame Ball ($16.80). It is fried for 20 minutes as the glutinous rice ball with sesame seeds has to be constantly rotated to retain its shape. The crispy golden sphere is cut at the table by the staff. It is not too oily and a great snack to complete the meal. The cluster of restaurants by the Les Amis Group at Shaw Centre is quite the foodie enclave to indulge in. I love the congee from Mui Kee as well as the beautiful tarts from Tarte by Cheryl Koh. My new favourite is the sumiyaki restaurant Jinjo, which specialises in charcoal grilled items that are simple yet flavourful. I start with yaki goma tofu ($6), which has a thin and crispy exterior and a surprisingly creamy interior. The housemade tofu is topped wth red miso from Aichi, the hometown of Jinjo's chef Makoto Saito. A selection of grilled items are also tasty and cooked just right. 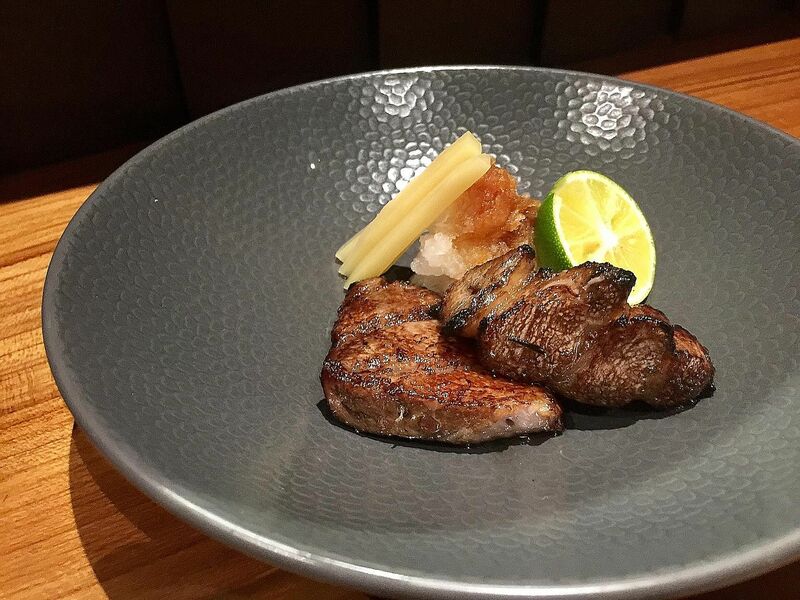 These include bonjiri (bishop's nose or meat from the tailbone of a chicken, $7), kama (fatty tuna belly, $28, above), hatsu (chicken heart, $6) and seseri ($18), which is chicken neck grilled over hay and served in a piquant ponzu sauce. End on a satisfying note with donabe (Japanese rice pot, good for two to four people), which offers Angus beef, Hokkaido king crab, freshwater eel and truffle options. If you feel like splurging, go for the truffle donabe ($48 with 5g of truffles or $72 with 8g of truffles, add $7 for 1g of truffle), which comes with the crunch of lotus root pieces. While we may not have the four seasons, it is great to have chefs switch things up with seasonal produce. Chef Julien Royer of two-Michelin-starred French restaurant Odette has introduced a selection of summer dishes - a feast for both the eyes and palate. Prices are $188++ for a six-course lunch or $248++ for an eight-course lunch. 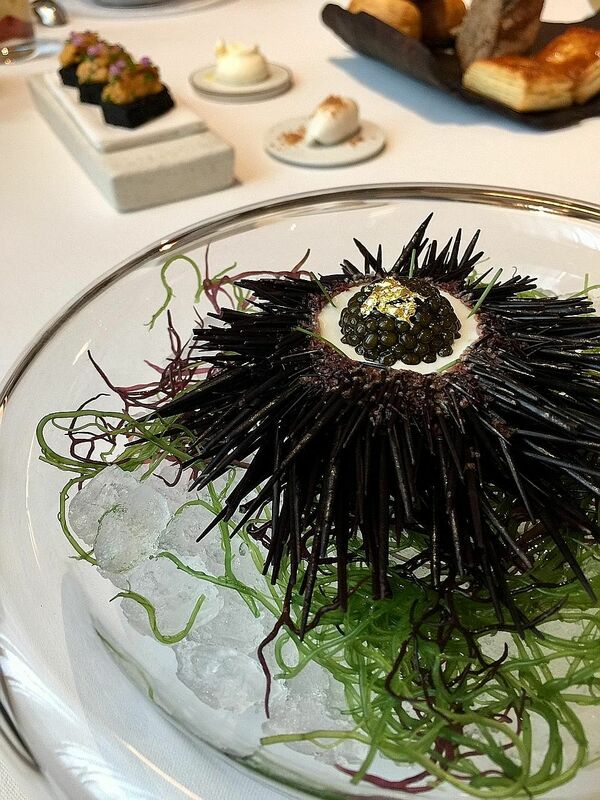 The Hokkaido uni starter (above) features spot prawn tartare with mussel cloud, caviar and squid ink toast; and the Tomato Collection has stracciatella "artigiana" (burrata), spiced piquillo peppers and taggiasca olive. I've tried chef Royer's beetroot variation of the Tomato Collection and enjoy the combination of fresh tomatoes balanced with peppers and creamy cheese. Another hit is the perfectly cooked Brittany Blue Lobster, which is paired with endives and a light sake-based sauce. Also, don't miss the cappellini with confit egg yolk, 24-month comte cheese and freshly shaved black truffles; as well as the akami tuna "flower" with charred kabu (turnip), sudachi vinegar and wasabi. The one-Michelin-starred Meta restaurant, which offers French-inspired cuisine with an Asian twist, has launched its new Summer menus ($118 for five courses, add $90 for wine pairing; $158 for seven courses, add $110 for wine pairing; vegetarian menu available at the same prices). Both five-and seven-course menus start with Japanese bonito with endive, orange, and katsuobushi (dried and smoked skipjack tuna); and confit beetroot with foie gras mousse in a fragrant basil oil topped with a beetroot-port wine puree and puffed buckwheat. Another standout is the New Zealand rack of lamb, which is grilled on charcoal and served with zucchini puree, lamb jus and charred garlic shoots. I like the unique addition of fermented black beans, which gives a good dose of saltiness to the dish. The seven-course menu also offers a Carabinero prawn (above). 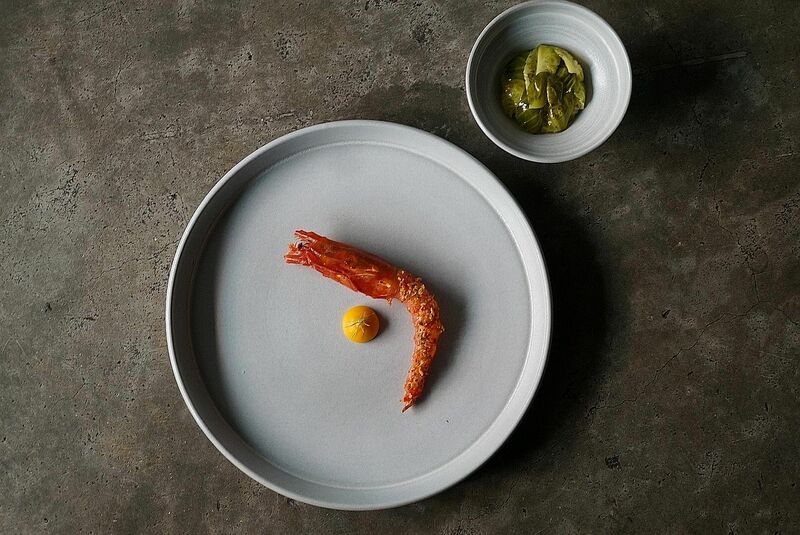 The sweet prawn is cooked with prawn oil and butter, then paired with butternut squash puree and garnished with kaffir lime shavings . It is served with white Korean rice mixed with housemade sambal and charred Brussels sprouts. A refreshing end to the meal is Tropical Summer, a dessert with creamy coconut glutinous rice, coconut and pineapple crumble and a delicious kiwi sorbet and coconut granita. Book a meal at Jinjo and Meta with Chope.